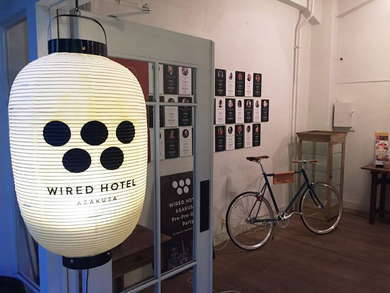 One of the newest hotels in the old-world part of Asakusa, Wired brings a refreshing and contemporary face to a traditional neighborhood. 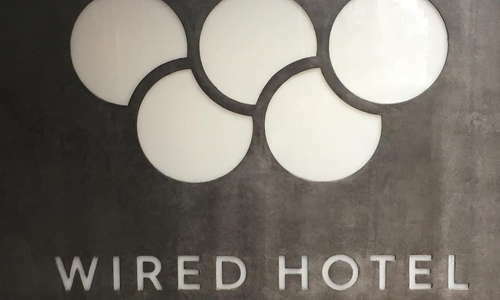 Hip, playful, and cool, the Wired staff are friendly and veritable experts who help you have the best stay both in and out of the property. Staying here, you’ll find young, adventurous, budget-conscious travelers who want to experience something authentic while embracing modernity at the same time. 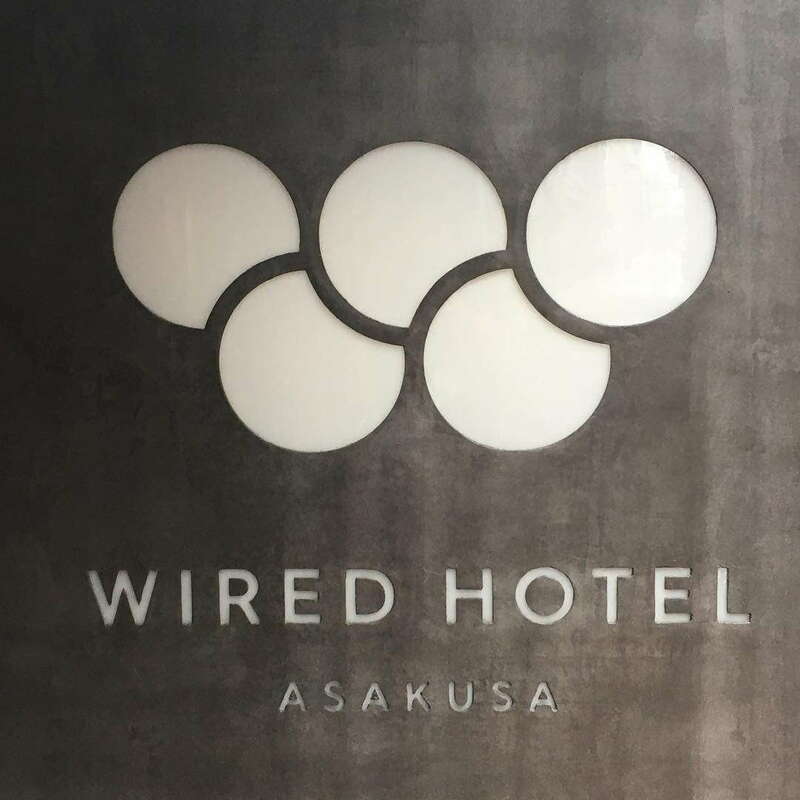 Grab the hotel’s 1Mile Map Guide – a curated and detailed list of all the best places to eat, drink, and explore in Asakusa. There’s a wide array of rooms here and all have unique design elements. In all the rooms you’ll find minimalist stylings with hardwood floors and modern furniture. The range of room types goes from a penthouse suite to shared dorms and bunk beds. In-room amenities include free water, slippers, Bluetooth speakers, and yukata pajamas. There’s a communal lounge and kitchen for dorm and bunk bed rooms. The hotel encourages community throughout the hotel. The bigger the room, the better the bathroom at Wired. On the high-end side you’ll find black-and-white tiled floors, giant bath tubs and Toto toilets. Dorm rooms have shared bath facilities, but the hotel will provide all the toiletries. The lobby here is a cool place to hang out with large wooden tables, a restaurant and bar, and a bevy of tips to help guests explore the neighborhood. Check out the menu board by the front desk. You’ll find note cards that you can pull off the wall to give you great ideas for restaurants, bars, and things to do in the Asakusa. Also, check out their free audio guide app that can give you an expansive tour of the surroundings. There's no gym, but you can rent the hotel's bikes. It's 1,500 Yen for the day. Zakbaran is the hotel’s signature restaurant and serves flavorful takes on tofu for breakfast, lunch, and dinner. The hotel often has themed events that take place in the restaurant area. Ask the hotel upon arrival for any upcoming activities that you can take part in. Zakbaran’s bar specializes in sake and even has a sake tasting happy hour that includes food for only 1,500 Yen. Asakusa is one of the best walking neighborhoods in Tokyo, and within a mile of the hotel you’ll find all kinds of restaurants, bars, and attractions. There’s also a subway station a few minutes away that makes it easy to get around town. If you’re staying at Wired, make sure you pop into Fruit Parlor Goto (1-minute walk) next door. You’ve never had a parfait quite like it. On cold days, check out Unsuke (4-minute walk) where you’ll get steaming hot plates of Japanese curry. Craft beer lovers should check out Campion Ale Asakusa (8-minute walk) for cold brews and fried camembert cheese – yum. For a classic haunt, head over to Kamiya Bar (10-minute walk) which is known for a unique signature cocktail and has been in business since the late 1800s. 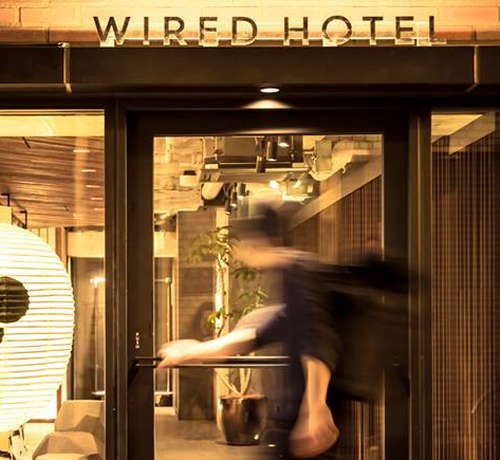 Wired Hotel is a modern addition to this traditional neighborhood, but it fully embraces its roots and prides itself on immersing its guests into the community. Rooms here range from high-end suites to dorm options, so there is something for every price point. You won’t find a gym, spa, or pool, but the restaurant and bar are great, the staff uber-friendly, and the location right in the middle of the action.